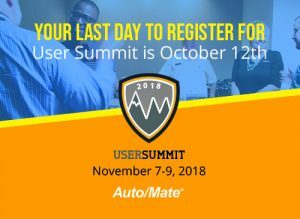 Have you signed up for Auto/Mate’s customer User Summit yet? If not, you better hurry because the deadline is Friday, October 12th and this is an event you don’t want to miss! It doesn’t matter if you’re in sales, service or accounting—we’ve got sessions designed just for you! You’ll learn tips, tricks and shortcuts that will make you way more productive! We are more than just a vendor, we are a partner and contributor to your team’s success. Sure, we can talk on the phone and converse via email, but there’s nothing like being able to put a face to a name. When you attend the User Summit you’ll finally be able to get to know your friendly Auto/Mate team members in person, and we can’t wait to meet you! Did you know that Auto/Mate has released major updates to AMPS this year? We’re excited to share the details of all our latest offerings, including a new parts module, updates to the sales suite, eDeal Signature Capture and mobile AMPS. What better way to learn about these new features than viewing live demonstrations and being able to ask all the questions you want to the experts on hand. This is your opportunity to meet our software developers, learn what’s in the pipeline and give us your “wish list” of features. What do you like about AMPS, what don’t you like and what do you wish was different? Our dev team will listen to your feedback and consider all suggestions. Don’t miss this incredible opportunity to help shape the future of Auto/Mate! Your registration includes attendance at two sponsor-hosted happy hours, breakfasts and lunch, so there’s plenty of opportunity to mingle, get to know attendees from other dealerships and have fun! We’re so grateful to the more than dozen Auto/Mate partners who are sponsors of the User Summit. This event couldn’t happen without them! As an attendee, you’ll have plenty of opportunity to learn more about their product and service offerings. This year our User Summit is at the Hilton Palacio Del Rio, right on the River Walk in beautiful San Antonio, TX. We encourage attendees to make sure they have time to take in the local sights, including seeing the Alamo, strolling down the River Walk or taking a gondola ride. So, what’s your excuse for not attending the User Summit? Our past attendees have all raved about how worthwhile it was, how much they learned and how much fun they had!